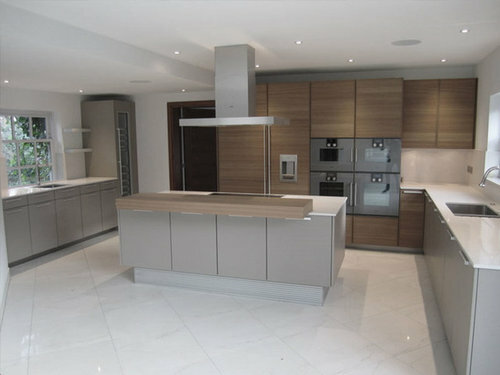 This Poggenpohl kitchen was installed but never used in it’s original prestigious property in Hampstead, London. It’s original price was around £90,000 but one of our customers bought it from Kitchen Exchange for just £25,000. I'm just curious why people would pay £90k for a kitchen, fancy name or not. Hi ...Zaz I am not sure what went on here in Houzz .... While I have been away ..(sneezing coughing sweating) Whatever it was Move on from it !! as best you can ... Otherwise these things eat away at you ... And being on a downer that's not good for anyone ..........including you .... You have a Talent truly you do Lots see it ...... Even if you can't ....... So Put it toooooo good use If not for yourself ........ Then for others so they might enjoy it Seeing others smile from Something you have done Is gift.... I know I love toooooo Give that gift of a smile ..... Be it from writing or resisting my Poems Playing my little ukuele Painting So dust yourself off there's work toooooooo be done :@) Get your a@£&amp; In that kitchen ... Today is the start of a new and better year ...... Of which only You Can make happen !! First before you think of putting grey on your walls take into account the light in your kitchen. Where do you live? Is it sunny most of the year? Is your sky grey 4 to 6 months of the year in the winter and spring? Grey can be very depressing when you are surrounded by it day after day. My vote is for white walls or a light color. You also have to take into account what the other rooms are painted that are open to the kitchen's sight line. Hello Duncan, They are good and I am biased as I don't use companies that don't provide trade discount... as I usually like to help my clients out... Here's a few images and an edging on a runner can be lovely too... I have also included one of a painted stair... So you have an option all of which are rather striking.... : )) x http://www.naturalrugstore.co.uk/coir-rugs.asp?gclid=Cj0KEQjwiKS3BRCU-7XQ75Te3NoBEiQAA2t_xPmcwAZ3TS0Qhq1t1hzYsP-r8oFgdC385qXO88eXioYaAjCE8P8HAQ The painted one... I would include the banister in this scenario.. So 25K is ok, but 90K? How? In answer to how it gets to £90,000?...... I can see Gaggenau ovens which I believe are £4500 each. This kitchen probably had over £30,000 worth of appliances when new. Prestige work surfaces are expensive too and a top of the range surface like Dekton could have retailed at £15000+. 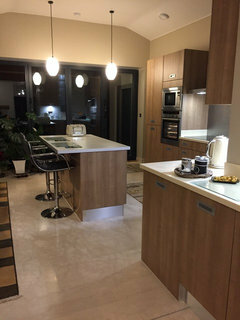 This kitchen also has lots of non standard features such the doors for the fridge and wine cooler that are not available from mass market kitchen suppliers. Personally I think the second owner got a bargain. This discussion comes down to how you want to spend your money- for instance if you want a jumper you can buy something from the supermarket for £8, M&S for £35, Reiss for £80 or a designer name for £400. The choice is down to the available budget and the quality you want. I would also point out that if you have a property worth £2m+ that you want to sell at some point you can’t put in a cheap kitchen and expect to get top dollar. I understand what you're saying Jonathan, and I agree the second owner got a bargain. But I do find the idea of a kitchen relating to a percentage value of the house idea a bit tricky. That would imply that houses in the North have cheaper poorer quality kitchens than houses in the South? It's a strange one. Sounds like someone did a good deal on this one. Looks even better " after "
I don’t think there is any suggestion that property in the north has cheaper kitchens. My only point is that if you are expecting to sell for profit you must invest in the quality the buyers expect. Hello Jonathan, I'm not suggesting that the article says this is the case, nor indeed you, so forgive misunderstanding. It's general advice about how much to spend on a kitchen in relation to the value of a house. Kitchens are so very expensive and it seems like a subject that causes much stress to people. I don't think there is an expected amount to spend, just a budget to stick to. Fisher & Paykel Appliances UK & Ireland Totally agree! The kitchen is lovely but would never ever have looked at it and thought it was £90,000 The new owners have done a lovely job with it, and its all proportioned well and suits the space. I suppose like anything you can pay a high price for something but its how you style it that makes all the difference. 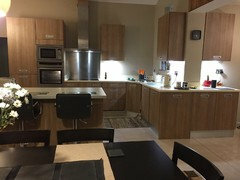 And here's a kitchen we bought second hand from eBay for just £1200 inc all appliances ( inc dishwasher) We just had to adapt to fit to the space. We found the date on one of the cupboards 10 years old and hardly used. I enjoyed the searching part too and we are made up, it doesn't have to be expensive to look nice and be functional. Thank you Amordesigns! It's been 3 years of our self build extension and we finished the open plan room just before Christmas. I guess with it taking so long we had the thinking time to get the space to work. I'm still at the can't believe it's finished stage!! Marie, now that is what I call impressive. What a bargain! Nice kitchen and even nicer bargain. Well done! Lovely kitchen but hate to say it, 90k! I just can’t see it, I’ve the same ovens but they weren’t 4.5k each, well done to the person who got it at 25k, looks really well refitted. Sorry to say but Marie kw’s ebay £1200 bargin has just blew me away! Well done. I think the wood around the window makes the space look dark also the beams are out of place, dust collectors! @ Kitchen Exchange. Yea, why not? @Beano Thanks for you comment! 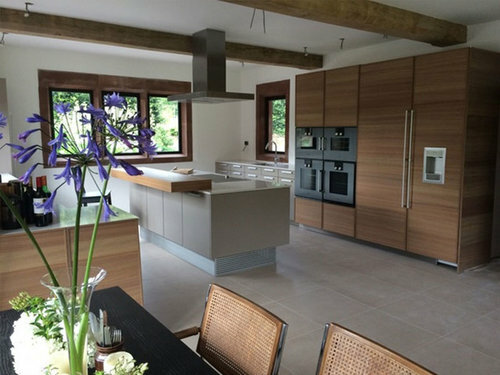 We agree, Marie kw's kitchen looks amazing!